To increase overnight stays and to nurture a visitor-friendly atmosphere. To encourage business and leisure travelers to choose Red Wing as a year-round cultural, recreational and meeting destination. 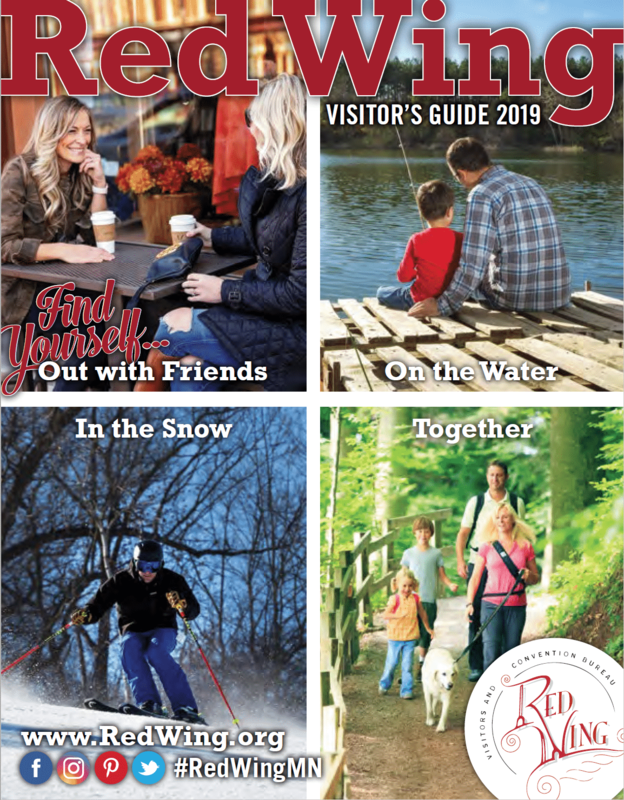 The Red Wing Visitors & Convention Bureau is your resource for making your visit to our community a fun and memorable time. We support our local businesses and attractions by promoting and sharing all the amazing things our community has to offer. We have information on events, shopping, dining, maps, and the inside scoop on all the important details to maximize your visit. The Visitor Center is located in the historic train depot at 420 Levee St. and is staffed with experts that are ready to answer your questions. Q: Is the town named after the shoes or are the shoes named after the town? A: The town was named after Native American Chief Red Wing in 1823, long before shoes started being produced by Charles Beckman (in 1905). Q: Can we tour the shoe factory? A: Unfortunately no, but there’s a video at the Red Wing Shoe Museum that you can watch to give you a glimpse inside the factory. Q: Do they still make pottery here? A: Yes they do! Visit Red Wing Pottery & Stoneware to take a tour and see pottery still being made just as it was years ago. Q: Where do you suggest we stay during our visit? A: Everyone has different needs of course. Check out the lodging chart on page 26 to choose the accommodations right for you! Q: Where is a good place to eat? A: We have great choices! Check out the dining guide on page 34 to see which restaurants offer breakfast, lunch, dinner, kids menus, and more. Q: How do we get to Barn Bluff? A: From Plum St. (Hwy 58), travel east on W 5th St. The trail head will be on the left after driving under the Hwy 61 overpass. Check out the map on page 23 to help find your way! Q: Where can we see the bald eagles? A: Colvill Park is a great spot to search for eagles that come back and nest every year. They’re easier to see when the trees are bare in the colder months – spy them perched on tree branches. You can also watch our social media for updates on eagle counts. Q: Can we walk or bike along the river? Where can we find trails in town? A: The Riverfront Trail connects Levee Park to Bay Point Par and offers a nice stroll or ride right along the river. You can find other trails for walking, hiking or biking on pages 19 and 23 in this guide. We should also mention the historic walking tour, with information offered on page 13. Q: Do you have sample itineraries for my length of stay? A: Absolutely we do. Call or email us at the Visitor Center and we’ll be happy to provide an itinerary specific to your visit, or you can go to RedWing.org to find our most popular itineraries.